Dark Horse Books, 9781616556037, 104pp. Sergio Aragonés is said to be the fastest cartoonist in the world today. He is certainly the most honored, having won every major award in the field, including the National Cartoonists Society's Reuben Award, and the Will Eisner Hall of Fame Award. He was born in 1937 in Castellon, Spain but his family soon relocated to Mexico during the Spanish Civil War. In Mexico, Sergio studyied Architecture at the University of Mexico, and learned pantomime under the direction of Alexandro Jodorowsky. Sergio's first contribution -- "A Mad Look at the U.S. Space Effort" -- appeared in Mad #76, cover-dated January of 1963. For that same issue, he also contributed the cover gag (the first of many) and his first "Marginal Thinking" cartoons to be printed in the magazine's margins. He has since appeared in every issue of Mad except for one (the post office screwed up) and has done thousands of his unique pantomime cartoons. He also produced 16 best-selling original Mad paperback books. Sergio teamed with wordsmith Mark Evanier to bring forth the adventures of Groo the Wanderer. 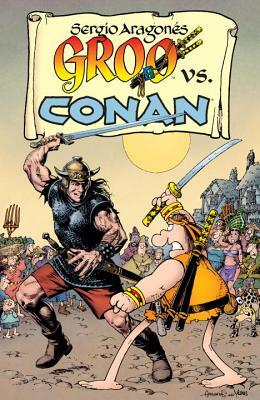 Groo quickly became one of the longest-running "creator-owned" comic book properties, outlasting many of the companies that published it. Sergio and Mark have also produced other comics, including Fanboy, Boogeyman, Magnor, Blair Witch? and an acclaimed series in which together, they trash famous characters: Sergio Aragonés Massacres Marvel, Sergio Aragonés Destroys DC, and Sergio Aragonés Stomps Star Wars. For their comic book work, they have received multiple Eisner awards. Sergio has also "soloed" with two all-pantomime series, Actions Speak and Louder Than Words and on his new comic from Bongo, Sergio Aragonés Funnies. The author lives in Ojai, California.